by Dollarhide, Colette T.; Saginak, Kelli A. An in-depth look at all aspects of creating and managing a comprehensive school counseling program, with a focus on designing systemic programs to serve all students. Accessible and inclusive, this comprehensive guide to K-12 school counseling explores delivery systems and the practical tools professional school counselors need to design, implement, manage, and evaluate comprehensive, developmentally appropriate school counseling programs for all students. Starting from the perspective of “what is a school?” it presents and updates all of the elements of a comprehensive school counseling program, including the holistic, balanced, preventive, and reflective elements, and those integrated with the academic agenda. Aligned with the most current ASCA National Model, ASCA Competencies, and new 2016 CACREP Standards, Comprehensive School Counseling Programs underlines the professional context of school counseling in the real world of public education. 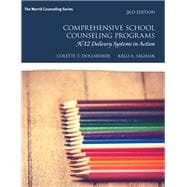 The updated, revised chapters of this new edition written by contemporary experts in the field of school counseling. Colette T. Dollarhide, Associate Professor of Counselor Education at The Ohio State University, earned her master’s and doctorate degrees in counseling and educational psychology from the University of Nevada, Reno. She earned her bachelor’s degree in political science from California State University at Fullerton. She has been a counselor since 1988 and a counselor educator since 1995. For the past 15 years, Dr. Dollarhide’s teaching and research focus has specialized in school counseling at the master’s and doctoral levels, but she has also taught career counseling, college student development, theories and techniques of counseling, foundations of school counseling, special issues in school counseling (at elementary, middle, and secondary school levels), counseling through play, ethics, consultation, supervision, group counseling, pedagogy in counselor education, and practice and internships. Her research agenda includes school counseling leadership, professional identity, social justice, and counseling pedagogy, and Dr. Dollarhide has published and presented papers at international, national and state conferences. Her professional service includes President of C-AHEAD (now AHC), eight years as a reviewer for Counselor Education and Supervision (CES), coeditor for a first-ever CES special section on school counselor supervision, four years as a reviewer for Journal of Counseling and Development (JCD), and Editor of the Journal of Humanistic Counseling. Dr. Kelli Saginak, Ed.D., NCC, lives with her family in Oshkosh, Wisconsin. Her career has served the field of counseling and education, as a teacher, counselor, prevention specialist, and consultant. Kelli is an advocate for young people and strives to educate, train, and inspire professional counselors to serve today’s youth, as leaders, advocates, and agents of systemic change. Her passion for youth inspires her writing, scholarship, and teaching in the areas of school counseling, counseling process, counseling with children and adolescents, lifespan development, and addictions counseling. Kelli presents on a variety of counseling-related topics and has co-authored several publications, such as: School Counseling in the Secondary School: A Comprehensive Process and Program and most recently, the 3rd edition of Comprehensive School Counseling Programs: K-12 Delivery Systems in Action.